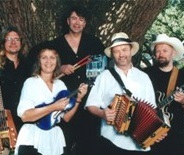 From Left to right: Band members of Cajun du Nord are:Goran Lomaeus from Sweden, Elsbeth Krogh from Denmark, Harald Aanes from Norway, Arve Haland from Norway, and Jorgen Hansen from Denmark. On Saturday, August 25, the Acadian Museum of Erath hosted the Scandinavian band, Cajun Du Nord, as a special Living Legends folklife series at the Museum Café in Erath. Museum Program Director, Kermit Bouillion said, "The band members come from Denmark, Norway and Sweden. What ties them together across the borders and language differences is their love for pure Cajun music, and we are pleased to host them again in Vermilion Parish." Many people will remember their performances last year at Festivals Acadiens, Vermilionville, Randol's and the Liberty Theatre. While on their last trip to Louisiana, they recorded a CD, titled Cajun Du Nord in Louisiana, in Terry Huval's Cap Rouge recording studio in Scott. This CD has earned them the CFMA's 2000 prestigious award for Best Foreign Cajun Band, an honor which was bestowed upon them last week at Blackham Coliseum during the "Le Cajun" Music Awards ceremony. The CD contains Cajun standards such as,"Danse de Limonade," "Flammes d'Enfer," and Nathan Abshire's "Blues de Tac Tac" ALL recorded on the Swallow Records label. Elsbeth Krogh of Denmark, who sings and plays fiddle and washboard, leads the band. She learned Cajun and Zydeco music from studying with various Cajun musicians while vacationing in Louisiana. Known in Denmark as Cajun Mama, Krogh has played Cajun music professionally all over Europe. She has also written a book about Cajun music and organizes Cajun workshops. She says that she will contact the Cajun Legend himself, D.L. Menard, while in Erath, to see if he would like to jam with them for a few songs. Guitarist and fellow Dane, Jorgen Hansen, joined the band after a career as blues' musician. Besides his work with Cajun Du Nord, Hansen plays with Danish group called Captain Crawfish and his Jumping Zydeco Band. Hansen says, "Danish music has a different beat, a different swing. The Cajun Waltz is much smoother, I love it." Drummer, Harald Aanes of Norway, has professionally played Mississippi Delta blues, jazz, and folk music, while bassist, Goran Lomaeus of Sweden, is a member of the top bluegrass group there, Bluegrass Swedes, and is a professional studio musician and songwriter. Arve Haland plays accordion and sings vocals, and has his own band in Norway called Cajun Gumbo. His band just released a new CD titled "Heit Gumbo." Also finding time to visit Erath, on this special trip, the band has scheduled appearances at Vermilionville, Randol's Restaurant, Café des Amis in Breaux Bridge, and G.J's Café in Branch.